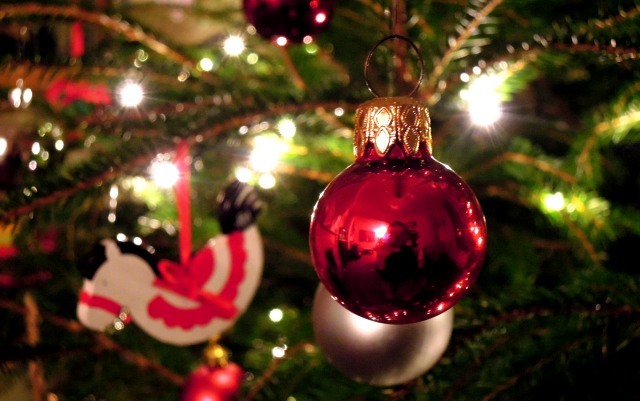 With only nine sleeps until the big day, it’s feeling ever so Christmassy here at Banger Heights. The decorations are up, I’ve shed a tear watching my youngest in the school nativity play and I’m enjoying choir rehearsals for the staff carol service in Wells Cathedral later this week – although I might need to mime the bit when I’m supposed to hit a high G.
When you receive a box of chocolates from Hotel Chocolat you expect something special and this luxury Christmas collection did not disappoint. As well as looking visually stunning, the flavour combinations are surprising and masterful; flavours that mustn’t be rushed but savoured slowly. If it takes a few days for my husband and me to consume a box of chocolates, that’s a good sign. We can only stuff our faces with cheap chocolate! And at £25 this is a fairly expensive box of chocolates, but if you’ve got the budget I’d say it’s well worth it. My personal favourites were the dark chocolate Christmas Stars with rich marzipan infused with orange liqueur, the Nutmeg and Almond Pralines, the Mulled Ports bringing together port, bitter orange and spices, and the delicately perfumey Pistachio Praline Crunch with its hint of rose. Just beautiful. More please! More delicious chocolates, this time from Heston Blumenthal’s range for Waitrose. 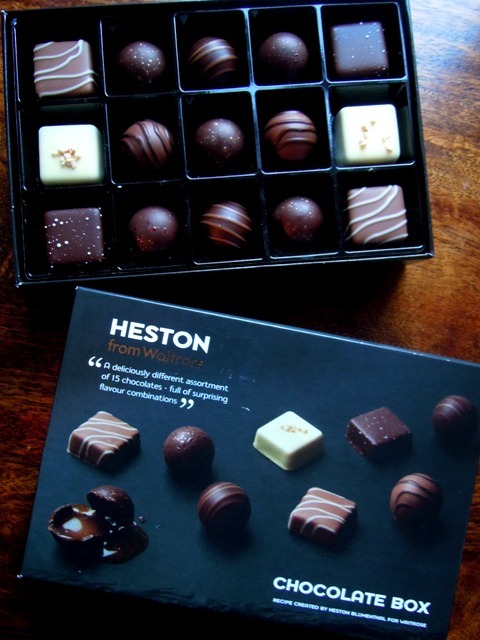 Heston’s Chocolate Box is also full of exciting and unusual flavour combinations, but at £10 is a little more affordable. I adored the Thyme and Rosemary chocolates and the BFGs were rather fun too – transforming the classic 1970s gateaux into chocolate form. Waitrose have hidden a special ticket in five of Heston’s Chocolate Boxes, and five lucky winners and their guests will be invited to join him for an unforgettable food experience. A sixth ticket is also up for grabs on the Waitrose Facebook page. My children were rather taken with these chocolate tree decorations from the Meaningful Chocolate Company. 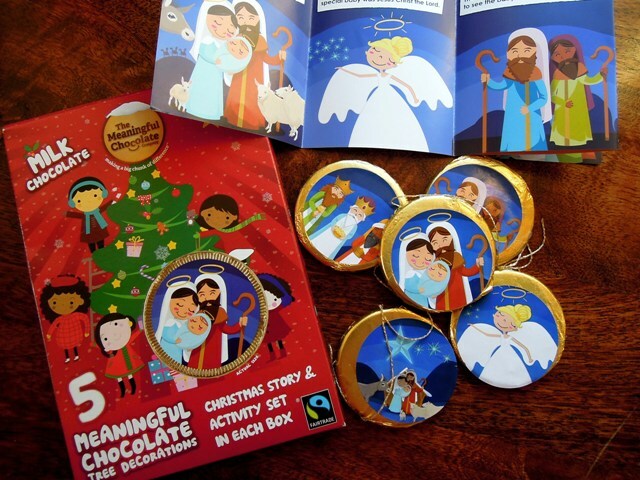 The box contains five Fairtrade chocolates onto which you place five illustrated stickers, as well as a copy of the Christmas story. The idea is you read the story as you hang your decorations on the tree. A donation from every sale goes to the charity Traidcraft. 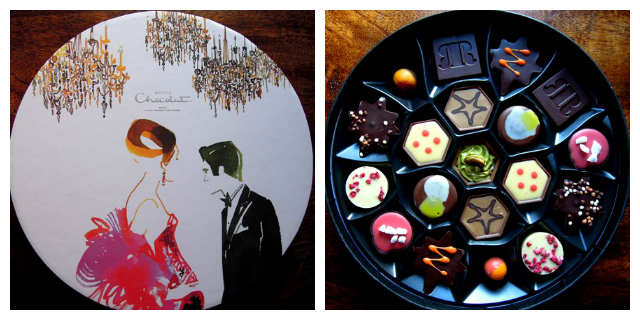 A lovely concept and the chocolate is good too. These Wonderful Pistachios and Wonderful Almonds are extremely good and perfect nibbles for festive get-togethers. In a range of delicious flavours, they are very, very moreish and pretty healthy too, as they are dry roasted without any extra oil. The salted almonds were just divine, while my husband and I practically inhaled the sweet chilli pistachios in a single sitting! There’s only one word for these bad boys – yum! 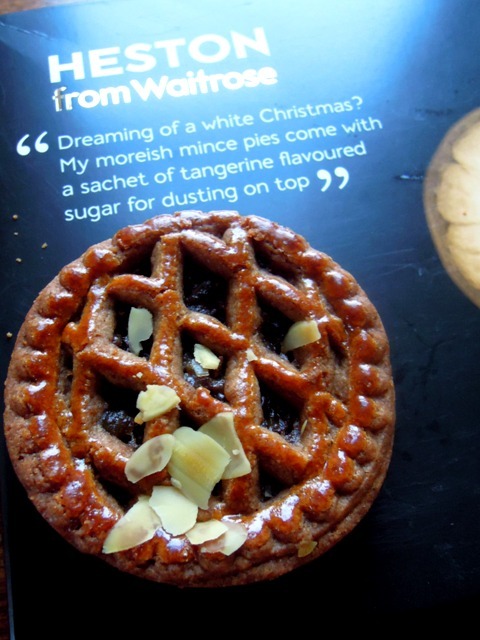 I know we should really be making our own mince pies this Christmas, as they are stupidly easy, but if you want to spoil yourself, these pies from Heston Blumenthal’s range for Waitrose are very good. The pastry is deliciously light, short and crisp and the mincemeat is rich and beautifully spiced but not overly sweet like so many other shop-bought mince pies. Unilever Kitchen sent me a range of products to try – perfect accompaniments to the Christmas meal itself and for the best bits, the leftovers. I’m rather partial to Hellman’s mayonnaise, but I’ve never tried any of their other flavoured mayonnaises. To be honest, they’ve never really appealed but I’ve been pleasantly surprised with what I’ve tried so far. The other day my children had their Christmas lunch at school, and so that my husband and I weren’t left out, I made us turkey sandwiches at home. I squeezed lots of the mayo with a ‘hint of lemon’ on mine (as well as a good dollop of Colman’s cranberry sauce), and it was absolutely scrummy. My husband tried the garlic mayonnaise on his sandwich, and devoured it in seconds. We also tried the garlic mayonnaise in jacket potatoes later that evening, which were very tasty, and I imagine it would be perfect with chips too. Since my first trip to Amsterdam as a kid I’ve had a thing for chips with garlic mayo. 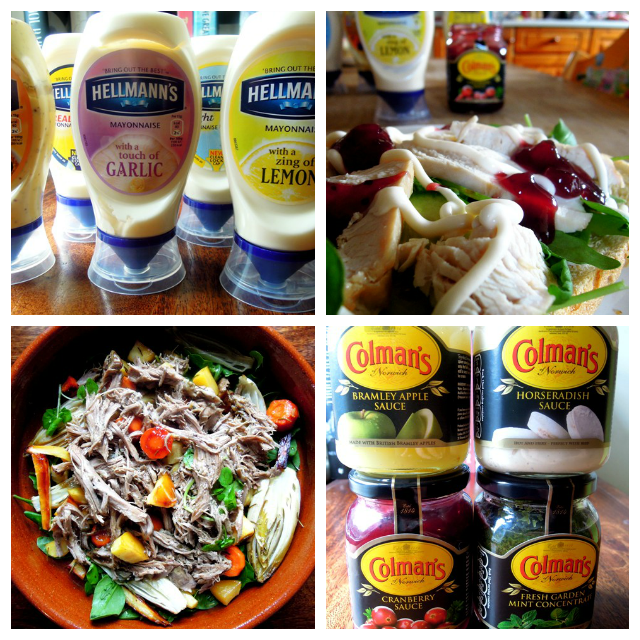 As well as making a classic mint sauce, I can also recommend the Colman’s mint concentrate as a cooking ingredient. I rubbed it all over a shoulder of lamb before slow roasting it for an Ottolenghi-inspired dish at the weekend (recipe coming soon), which worked very well. I imagine the mint concentrate would be perfect in a dressing for a Greek salad too. Fletcher’s Fine Ruby Port is a fairly light, easy drinking port, which I’d say is perfect for dinner parties when you don’t want to end on anything too heavy. The Wensleydale has a soft, creamy tanginess with lovely fruity bursts. So each get a thumbs up from me individually. But in my opinion, I don’t think they actually go all that well together. I’d say the port would work much better with a mature Cheddar or a good salty blue cheese. And the Wensleydale needs a dry, crisp white wine. But that’s only me, and I’m no wine expert! 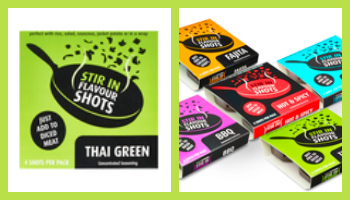 Finally, if you’re looking for quick and easy ways to transform turkey leftovers, I recommend you have some of these Thai Green Flavour Shots in your store cupboard. Containing all natural ingredients, these little gel concentrates add an authentic flavour kick to your meat and vegetables; I’ve used them in a butternut squash and spinach curry, as well as a chicken Thai green curry. They can also be used with rice, salad, couscous, jacket potatoes or in wrap. The Flavour Shots are available exclusively from Ocado. Other flavours are available, although I haven’t tried these out yet: BBQ, Hot & Spicy, Fajita, and Garlic & Coriander. If you’ve tried any of the others, do let me know what you think. Disclosure: I was sent complimentary samples of Hotel Chocolat’s Signature Christmas Collection, Heston from Waitrose’s Chocolate Box and Spiced Shortcrust Mince Pies, Wonderful Almonds, Wonderful Pistachios, Hellman’s mayonnaise and Colman’s sauces and the Aldi cheese and wine pairing for review purposes. No money exchanged hands and all opinions expressed are my own. They all sound rather fab. You must have had a good time opening and trying all these. Wow, you’ve been busy. One heck of a chore eating your way through this little lot! 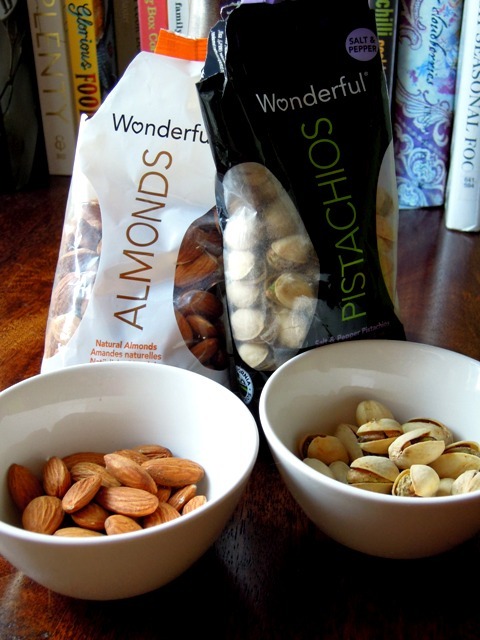 I had the pistachios and almonds from Wonderful and they are indeed Wonderful, especially the Sweet Chili. Interesting they disappeared a bit too quickly round here too, despite me trying to persuade the kids they’d be too spicy for them!. 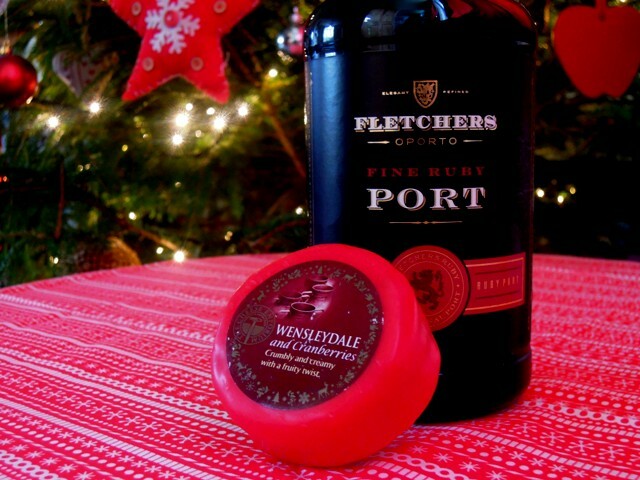 Port and Wensleydale – now there’s a combination that’s going straight onto my shopping list! The Waitrose chocolates sound pretty good too, I like the idea of rosemary and thyme chocolates. Some great choices! We are doing our festive shop for goodies this weekend so think I’ll take a note of a few of those. Thanks!